How to end the "Caps" debate: share your data. Forgot to say, I don't see any actual capping on my day to day sales. Just a sudden drop in overall percentage starting in January 2017. While I'm way too small be be taken seriously I would say that it's quite possible. Although I suspect the explanation is simpler and SS made a dramatic change to their algorithm that had a very serious effect on a small number of big suppliers...perhaps to reduce their payment costs or to encourage new entrants...I can fully grasp that and it makes sense. Not at all like a "cap". My theory would only make sense if it happened to a significant number of contributors at the same time. And yes - its not a cap, but may feel like a cap to some people. I recall that years and years ago many contributors to iStock were complaining about 'good days followed by bad days'. I experienced it myself - a couple of really good days would be followed by a sudden bad day. It all smacked of income limiting and was very obvious at the time. But they didn't do it by manipulating the search. Search positions remained stable but sales dropped significantly. It seems the way they did it was to limit what registered buyers could see - in other words the search results seen by individual buyers were not necessarily the same as the results seen by contributors or visitors. 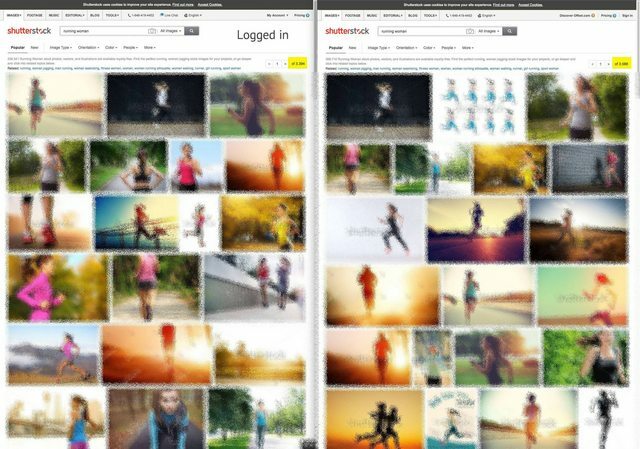 iStock themselves confirmed that they could 'tailor' the search results for all registered buying accounts. And this is probably what is happening at Shutterstock. Yes the search might move around a bit generally, but if they really want to control sales they simply have to remove or reduce certain results seen by particular buying accounts. They know which accounts are subscriptions, on-demand etc, and they know which contributors have had a run of above average sales or SODs. It would be a simple process to pull back those contributors from visibility to certain buying accounts. None of this will ever be seen by contributors or visitors - only by the registered buyers. Interestingly I've noticed a similar situation on Dreamstime. With their famous 'three good weeks followed by two bad weeks' again the search doesn't seem to change, yet sales can be dramatically different. Again I suspect they are able to tailor results to particular buyers accounts. For instance in January I had a very good month of on-demand sales. Very good. For the last couple of weeks though, all I've had is subs. Somehow the on-demand sales have completely disappeared, more than just coincidence. They only way they can do this is to 'remove' my portfolio from the registered on-demand customers temporarily. Of course only the customers will actually see the changed search results. It may have "smacked of income limiting" but did you do any statistical analysis of the numbers? It sounds like it could just be mean reversion/regression to the mean. In other words, that unusually high or low figures are usually followed by figures that are closer to the average figure. And this is actually about finance, but I think it could apply to stock sales as well. We can’t prove the individual capping theory because when we look our images are still there. But what if there are special algorithms for special big buyers?? Of course there is, and many other strange algorithms rules are hidden. So what's the relationship with contributors? If you are so good to fill the algorithms needs you'll always have a first place, sometimes with one image, sometimes with other. These has nothing to do with the author of the image. 1) No-one has shared any data that clearly shows a cap. 2) People seem to have very different ideas about what a cap is anyway. Some seem to say a cap is a decline in sales, and not a ceiling on income. They're very different things. Or do you just "know" that there is? But that's a different point. It's a weaker claim. Your claim was that there were different -- presumably you mean deliberately different -- results for big buyers of images. Why would the stock agency want to create a different algorithm for big buyers? What's the return on that effort? It seems logical to me, but I haven't did any test. It seems logical that a big buyer could ask to agency for "special" or "curated" search instead of loosing hours searching on zillions of similar images. Also for normal buyer it seems logical that some searches results change: let's say for example I'm an asian buyer and I'm searching for "women" or "people". It's logical that algorithm gives more relevance to images with "asian" in keyword. Or not? Anyway this is only my though. And it's a side question, not linked to your original question: in fact, there could be or not differences in search, but this is only from buyer side, not from the author side. Good points. BTW I'm in East Asia. I just did a search for "woman" on iStock. Only a few of the pix on the first page were not of East Asian females. Of course, big buyers can ask for "special" or "curated" search and results, that is why SS Premiere and other VIP services exist. As a Shutterstock contributor, your content is already available to Premier clients if you have opted into both Enhanced License and Sensitive Use. This includes your Shutterstock editorial content, which will appear on the Image tab, rather than on this new Premier Editorial tab. Regarding our Premier Editorial offering, photographers who contribute to the Premier Editorial collection have been selected by the assignment team based on their prior work in the news, sport and entertainment industry. While we are not currently accepting applications, we do evaluate contributors on shutterstock.com and in the past we have selected contributors to be a part of our Premier Editorial team. Cap or not cap, we are not treated equally, neither are buyers. Hi, I can verify your claim. I work in an advertising agency and regularly buy pictures at SS. What I have noticed is that when you are logged in the results change completely. I would even say that they are sometimes worse and do not deliver what you are looking for. Therefore, we are always looking for photos when we are not logged in and only log in for the purchase process. Unfortunately I do not know exactly when it started. It doesn't have to be a cap to be a change. Many good answers like location, which we've found before, or customer, or changes for different exposure. No I don't think any of this is down to an individuals or earning group, just a planned change how things work, that changes all the time. No one is being penalized personally. Remember if one picture goes down, another must go up. You won't see me complaining when I get four times my usual daily downloads. "Our search rankings are complex and based on a number of factors. Keywords, freshness, and popularity (downloads) all factor into search results. We focus on providing customers with the best image that matches their needs and we don't favor specific contributors or portfolios. Location can be a factor when the search query calls for it (for example, "streets of New York"), or when region-specific results are appropriate. We believe that if we always match the best possible media with a customer, over time this will lead to more satisfied customers, and in the end more downloads (and more royalties) for our contributors. That belief has delivered over 400 million paid image licenses to date. Search is powered by a set of services that include machine-learning algorithms: a type of software that is able to improve over time. In a very simple sense, the goal of an algorithm is maximize downloads. To get the right media in front of a customer, the algorithm takes many factors into account, such as how well the keyword matches a search query, or the past success of this particular photo, music clip, or video. For some search queries, customers are looking for newer content or content that has not been used before, and the algorithm will leverage factors such as the age of the media; for other queries, age is less important. There are many, many other factors that the algorithm takes into account, and we are adding more every day. One of the ways we improve our algorithm over time is to add new factors. We are also frequently making small changes in how the algorithm weighs these factors." Maybe not specific but the idea is not as simple as lets cut down someone who makes more and promote people who make less. Not as easy as setting a limit/cap on earnings. Ideas that many people have included in this thread are confirmed, region, buyer,has it sold before, freshness, age, and it's always changing. Sometimes it could favor some of us, other times lower earnings of some of us. We don't know, they aren't telling. No agency tells us how they actually present search results to a buyer. All this might have an effect of producing a level or earnings or a personal drop, but that's not their intention. Is there any sign of a cap in this graph? That's a three month period that happened several months ago. Is there a reason you're not showing more months, or more recent months? Maybe they don't fit with the steady growth shown in your small excerpt? Exactly! glad you remembered!! I got a buyer that I personally know at Y&R Ad-agency on the other side of the world to look for a specific pic of mine, in his search he found it, 14th pic on page 16. In my search is was 7th pic on page 3.....IS did actually admit to this many years back! This infentile part-time ghost-busting brigade actually think they physically put a cap, a lid on a jar on the whole thing, hahaha! . On the other hand who can blame them theyre fresh in the game. That looks a lot like a cumulative revenue chart so it will increase over time. I have one just like that but it tells nothing about revenue caps. Are more interesting chart would be a monthly revenue chart i.e. how much earned each month. Surely a accumulated revenue chart should show a cap, as the accumulated revenue would stay static for a while when the cap was active. Here you are. Any sign of a cap? The accumulated revenue would increase in a linear fashion unless the cap was zero. Either way graphs on their own prove nothing as an individual might think for some reason the cap applies specifically to them or a few other people. People will go on believing what they want unless SS come out and say "yes folks there is a cap.......so what?" Bad Behavior has blocked 55878 access attempts in the last 7 days.